The craze that caught on because of Gisele Bundchen is a fit, health conscious, supermodel. If there’s one person you want to take health advice from, it’s clearly a supermodel. We all take cue’s from celebrities, supermodels, actors, anyone in the public eye. They are clearly doing something right after all. Gisele has been seen leaving the gym, sipping her blue solar water as she totes her workout clothes. Since she is undoubtedly stunning, and looking fantastic and fit… we all start to wonder if maybe that’s the secret. You place some ‘spring’ water in a blue glass container and let it sit in the sun. That’s it. The websites that tout the health benefits of this technique will say that “solar elixirs” or sun-changed water is an old science that has been rediscovered. The blue glass and UV light will change the vibration of the water and clear your 5th chakra, the one associated with your throat. Unfortunately their use of the word “science” is pretty liberal. If you are truly worried about your vibrations and energy then by all means give this a go. It’s an inexpensive way to feel good and take some psychological power over your health. Until blue solar water has some actual science put to it, and it’s hard to imagine what could possibly take place, a placebo is all it’s going to be. 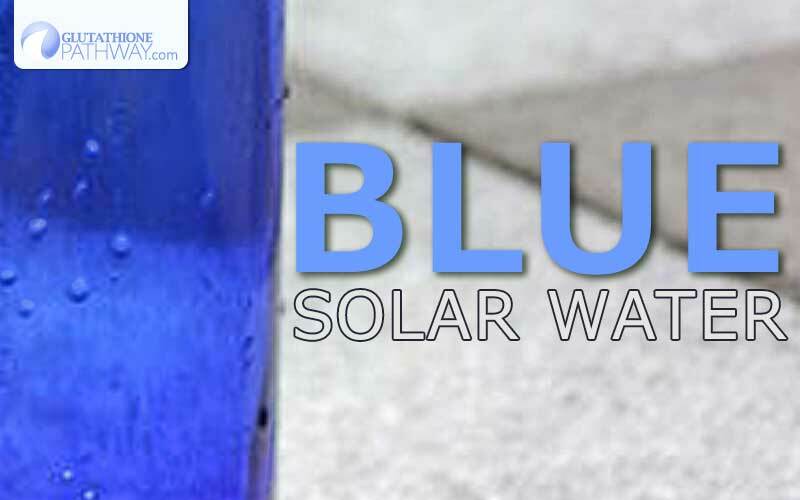 All misgivings aside there are a couple of things we like about the blue solar water craze. Staying hydrated is absolutely crucial for good health. The blue solar water crazed folks talk about your body being up to 80% water so it’s important to put good magic water into it. No, the truth is it’s important to put good clean water into it. Most of us don’t drink enough to stay hydrated, and that hydration is critical to all biological functions. A lot of us have been trained to stay out of the sun. While UV radiation can absolutely be harmful, vitamin D is our evolutionary answer to harnessing the sun’s power for our health. So get a little bit of sunshine or supplement Vitamin D3. Unfortunately the water sitting int he sun won’t do that for you. You have the power to take control of your health. Working out, eating right, supplementing well. These are all steps we can take that give actual measurable and scientific results. None may be quite as easy or cheap as putting water in the sun, but there’s a reason for that. Real results take some time, and some effort. Good supplements will often cost at least a little cash. The psychology of taking control with blue water is great, but we’d rather see you take control with something more meaningful and scientifically backed. So enjoy good clear water from any colored glass container, and stay healthy friends! I would recommend glass over plastic almost always. I’d also personally, skip the ‘solar water’ trend.